This recipe combines traditional St. Patrick’s Day ingredients in a different way. On a baking pan, place 2 potatoes. Bake in oven for 1 hour. Remove and let sit for 10 minutes. Cut lengthwise and scoop out the flesh, reserving the skins. Heat 1 teaspoon of olive oil over medium heat in a skillet. Add chopped cabbage and fennel bulb. Sauté for 5 minutes. Transfer to bowl and set aside. If you have a smaller skillet, do this in batches. Spread the mixture on a pan and put in oven alongside potatoes. Stir cabbage mixture approximately every 10 minutes, roasting for about 30 to 40 minutes. It may seem like a lot of cabbage, but it will reduce as it roasts. In the skillet, add pecans, bread crumbs, and herbs de provence. Heat, stirring occasionally, until lightly browned. Scoop potato flesh to a bowl, food chopper, or food processor. Blend to a mashed consistency, adding a little water if necessary. Remove to a bowl and stir in cabbage mixture, salt, and pepper. 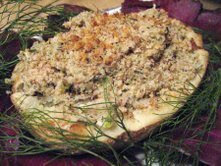 Spoon mixture into potato shells and sprinkle bread crumb mixture on top. Return assembled potatoes to the oven and broil until bread crumbs start to brown, about 2 minutes. Makes 4 servings (one-half potato per serving).